as i keep alluding to, my masters research this year is focusing on sound in the public space, especially within increased urbanity. i’m specifically investigating the divide between public and private sound – the choice over the kind of ‘noise’ you hear, through the groovy development of headphones, and what it is in public that we don’t hear when we choose to wear them. the research i’ve done so far has involved a couple of smaller projects which are starting to flesh out the crux of what i’m looking at. and the main thing i’ve learned is that, actually, the crux is a whole lot further away than a final year’s project. which means two things: that i’m going to be presenting more of a ‘study’ rather than a final ‘masterpiece’ and, that both mayhem and lucazoid‘s evil suggestions that i do a PhD is looking scarily feasible. these are headphone-based objects that play on the social codes and language surrounding the wearing of headphones and their role in creating acoustic privacy in public space. Headsets have been augmented with art materials also associated with soundproofing/creating quiet: cardboard, felt, cotton wool (in your ears, mate) and take on the oversized form of DJ heasets. And a range of text has been added to state explicitly the kind of language and messages that are often and/or unsconsciously conveyed through the wearing of headphones in public whilst listening to portable music..
Just the image of headphones over ones ears can be enough of a ‘do not disturb’ sign. 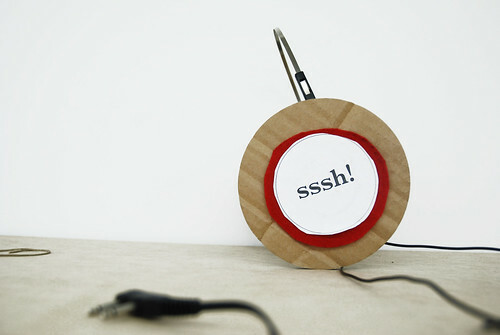 These MPUs shout this need for acoustic privacy:‘sssh!’; ‘private’ ; ‘!sssh’ (in arabic); ‘quiet time’; ‘mon moment tranquille’ (‘my quiet moment’ fr. trans); ‘please leave me alone’. 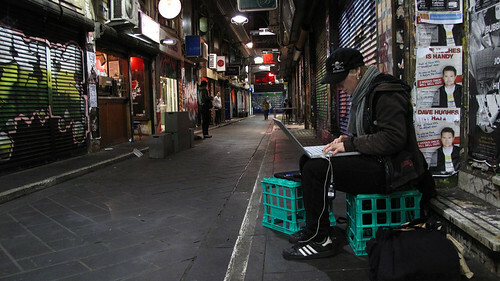 Images were made by occupying a selection of public spaces and mapping the ambient sound using a variety of capture technology. The primary device was the online Voice Drawing Tool by ze frank, which responds to sound through basic form from a laptop in-built mic: low volume curves counterclockwise, medium volume is straight, high volume curves clockwise. HD Video, Microsoft Word and still images were also used to record sound environment. The iphone/ipod touch application, Wide Noise was intended to be used, but didn’t function without an external mic on the ipod touch. This has become a comparitive study of place through its sonic output and the images represent the nature – aural and otherwise – of these places in visual form. The drawings also mapped the conceptual action of being in the public space, listening and measuring sound through drawing and technology. 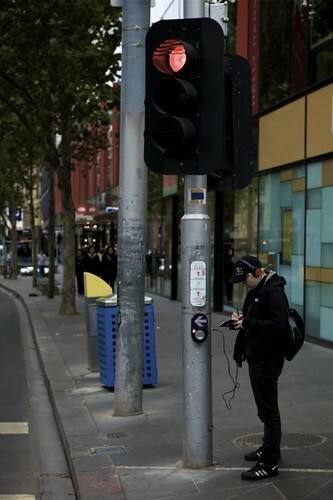 This project aims to draw attention to all of sound in the public space, the action of listening and headphones-as-device through the process and/or performance of actively listening to sites and their rhythms in the CBD. of engaging with the sound of the city and question their own engagement or response to sound, listening, dance and the ‘soundtrack’ of the urban environment, both public and private. This project also uses the artists’ occupation of space as a vital basis from which to make observations and to elicit change within the public realm. It places itself within the ‘political’, people-focused, process-based aspect of arts practice. using the mobile privacy units, i made an ‘audio guide’ for the underground art space at collingwood housing estate, during their Living Art project. the work, which caricatures gallery audio headsets, encourages the viewer to note what they see in the gallery, and what they hear. and when i say ‘note’, i mean it – the work comes with little cards with a list of 5 things they’ve seen and 5 they’ve heard. whilst it wasn’t an absolute hit in this setting, i think i’m going to push it a little and see where it goes, in terms of gallery settings – maybe even public gallery settings. emergency dance zone: public permission to rock out. for when you’ve got a killer track in your headphones and you’ve just gotta dance. kind of like a porta-loo for dancing. changes afoot, dates and locations TBC. the listening to the city XL. i think i’m going to work this one up into a larger scale – 20 or so artists in a smallish city block. the cone of silence – a ‘silent’ space in a public gallery. in september/october in melbourne. i’d also love to do a workplace-based work, plugging into the whole culture of open-plan offices using headphones as privacy devices. but we’ll have to see. these images and some of the text are from my first publication for uni – a durable visual record – which was made in the vein of a 7″ rekkid. with a DVD of ‘bonus material’, liner notes and a booklet. i’ve uploaded the main part of it as a PDF here. and as a presentation here. if you feel like it. Next PostNext black wall, white text, feminist discourse.